There is always one area in your home that you would call a family or living room because, well, this is where the members of the family usually bond together. It is where you watch shows and movies, chit chat, lounge, or at times, play with the kids. Of course, this area of the home will never be complete without a sala set or a sofa. Today, you can already find a number of sofa designs, sizes, and styles. One of which is the sectional sofa. Sectional sofas are a trending piece of furniture that most households have on their list of items to get if they haven’t already done so. That is for the reason that rather than having a sala set with three separate pieces, why not have one where all the pieces are connected and can be sectioned off when you don’t want them to be connected? What makes sectionals cool is that they can save space by having all the chairs, that would have been separated, bundled together as one. It also creates sort of intimacy between the people who will be on the sectional sofa as they are closer together. Since a sectional is a long sofa, it may be possible for you to rest comfortably on it so long as the pieces are fused together, and the cushions are fixed. You may, however, want to get your own pillow as any pillows that come with a sectional are usually for decorative purposes. Also, you should not sleep too much on your sectional sofa because you don’t want the cushions to sag too soon. Thus, if you are interested in buying a sectional sofa but don’t know where to start, then this article can help you out as it reviews a large, u-shaped sectional sofa. The Sofamania Velvet Sectional Sofa could possibly prove to be a lovely addition to your living or family room. It is spacious or large enough to accommodate almost the entire family, so long as there are not more than six persons. If you want to move away from traditional color options, then you should consider getting your room the purple sectional. Getting the purple will help you to move out of your comfort zone successfully. This is also available in black, gray, and navy colors. 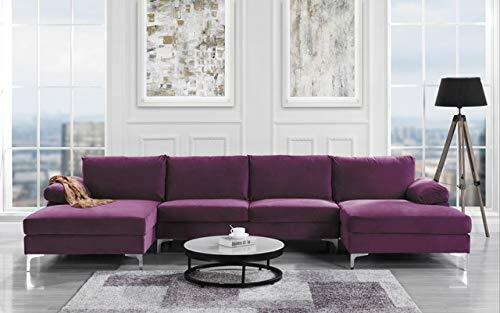 The Sofamania Modern Large Velvet Fabric U-Shape Sectional Sofa is a product that can bring the entire family closer together since it is capable of seating six individuals at a time. Its durable fabric is meant to withstand several days and even years of lounging. What is more interesting is that it is sold at a very reasonable price. This product is integrated with a memory foam material. Though this cushion may seem a bit uncomfortable to some, it offers the advantage of surviving the “sagging” phase for a couple of years. The problem though is that the cushions tend to move a lot when you lie on this sectional sofa. So you may have to attach some Velcro fabric to them to keep them in place. In addition, you might have concerns assembling the sectional sofa. So, if you are not a person who is used to assembling things or handling DIY projects, you may want to seek out someone’s assistance to help you put it together. Nonetheless, it comes with an instructional manual that can help you out. As with color availability, it comes with dark, neutral shades. The fabric upholstery is made of velvety materials that are durable, but you will have to take care of the product well because this type of material attracts lint easily. Comparing products in the same category is something that an intelligent buyer should always do since it will ensure that he or she purchased the almost perfect product. Thus, we compared the Sofamania Modern Large Velvet Fabric U-Shape Sectional Sofa with the GDF Studio Bridger Deep Red Fabric Sectional Couch. The main reason is that they belong to a similar price range. They are also both available in multiple colors to suit the buyer’s individual taste. While the GDF’s Sectional Sofa comes in dark shades of color, the color options for the Sofamania Sofa include deep red, dark blue, dark gray, and light gray. As such, they are also less prone to stains. However, the sofa from GDF comes in five pieces, which is one chair more than the one from Sofamania. Nonetheless, the Sofamania Sofa has two long couches where you can extend your feet comfortable. On the contrary, the one from GDF requires an additional ottoman so that you can stretch your feet while seating. The Sofamania Modern Large Velvet Fabric U-Shape Sectional Sofa is a perfect product for homes of large families as well as for homeowners who love to entertain guests regularly. It is also the perfect lounger for spending time with and cuddling up with your family in front of the television. It is a comfortable sofa that won’t break the bank or require a replacement in the near future. If you are seriously considering the Sofamania Sectional Sofa, you should be sure that it can fit the space you intend to house it in. That is because it is a bit on the larger side and is just one inch shy of being a twelve feet long sectional. Of course, you should not buy a large sectional for a small room because sectionals can overwhelm a space that is too small. So, measure your space before purchasing this.